Please join us for a special concert celebrating the season, featuring the classic Christmas movie The Snowman! The Diablo Symphony will perform live the beautiful orchestral soundtrack by composer Howard Blake. Along with the Tri-Valley Repertory Theatre’s Broadway Chorus, we will also perform festive holiday favorites! 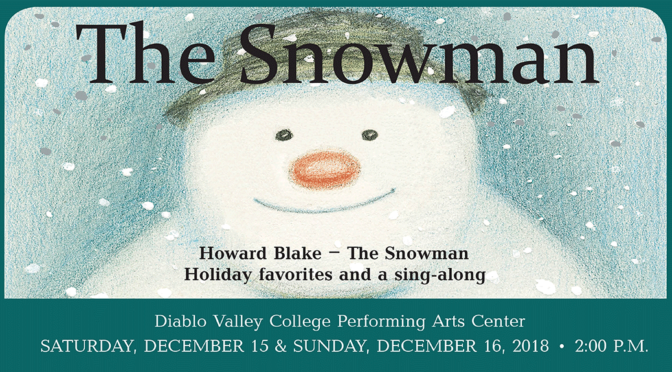 The concerts take place on Saturday Dec 15th and Sunday Dec 16th, at 2:00 pm at the Diablo Valley College Performing Arts Center . The Snowman is an animated film first shown in December 1982 on British television. Adapted from the 1978 children’s book by Raymond Briggs, it tells the story of a young boy who makes a snowman on Christmas Eve; the snowman comes to life, and together they go on a magical adventure. The Snowman was nominated for the Academy Award for Best Animated Short Film, and has remained a perennial Christmas favorite ever since. The soundtrack for the film was composed by Howard Blake (1938-), who has also written numerous other film scores and concert works. The centerpiece of the soundtrack is the song “Walking in the Air”, which has itself been widely covered by many artists; local talent Olivia White and Erin Hennessy will be our featured sopranos. The Diablo Symphony Orchestra will also perform holiday favorites by Delius, Stokowski, Waldteufel, and Anderson, and will be joined by the Tri-Valley Repertory Theatre’s Broadway Chorus for a Christmas Carol sing-along. The Broadway Chorus is a non-auditioned community chorus that welcomes all singers ninth grade to adult, and is music directed by the DSO assistant conductor Jed da Roza. The Diablo Valley College Performing Arts Center is located on Golf Club Road, adjacent to Parking Lot 8. Parking is free for performances on Friday, Saturday, and Sunday.